See anything odd about this photo of Royal Navy dispatch riders? "The film may have been made by the Crown Film Unit which was the successor to the GPO (General Post Office) Film Unit. 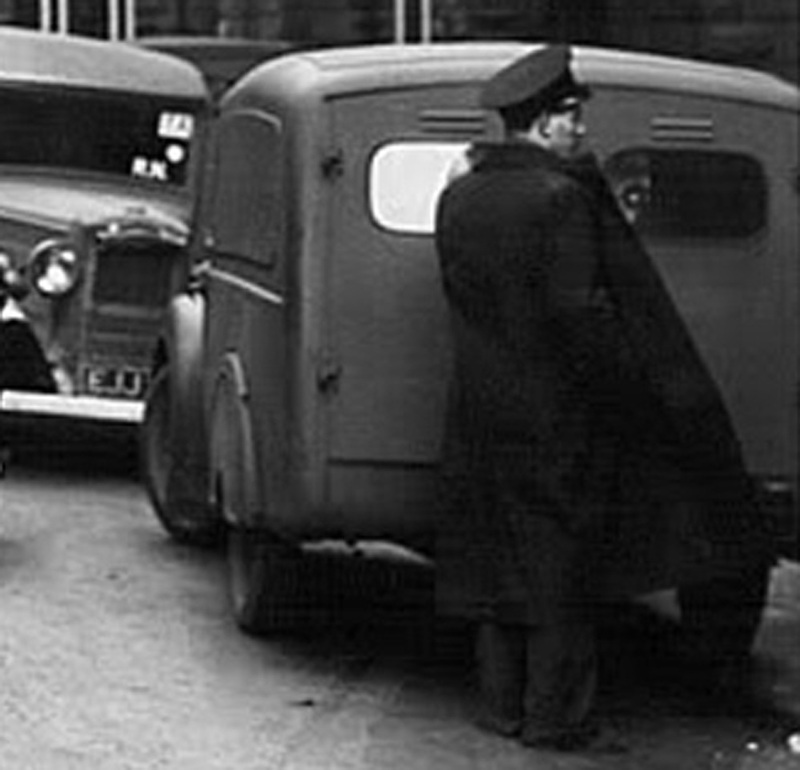 The van appears to be a Morris Z Type apparently made from 1940 onwards and used by the GPO. Circumstantial (evidence)? 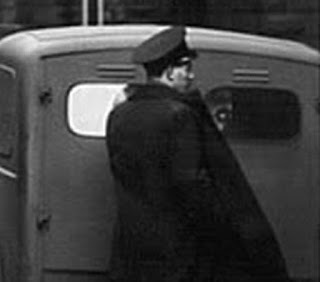 The appearance of the Unit's logo on the van doors maybe spoiled the verite (that's yer actual French,) of the natural feel of the shot as pioneered by the Unit and Director Humphrey Jennings?" This motorcycle photograph has something to hide. It's the World War II era photograph of Royal Navy dispatch riders I featured recently on this Royal Enfield Motorcycles blog. 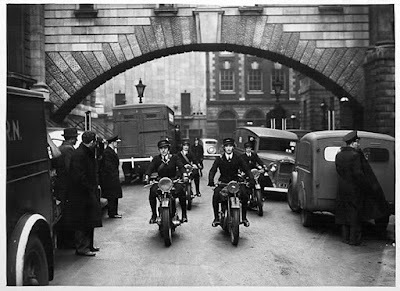 The photo of women motorcyclists riding in formation near the Admiralty in London never was meant to go on the Internet. But it has, and now its subterfuge is exposed. The photo would have been shot by a wartime information (propaganda) department to encourage women to do their bit for the war effort. Prints of the photo would have been widely distributed to newspapers and magazines. These print publications would have engraved the photo, introducing a dot pattern that disguised any small flaws or retouching. Sure, the editors would have noticed retouching on the original print. But publications of that time (and even much later) did not object to retouching and in fact most photos approved for publication were retouched to improve their appearance once printed. Add a little "shadow" around someone's head to make it stand out from the background, for instance. But this photo has been retouched, not to improve it, but to hide something. We can see the retouching for ourselves in today's digital format. In fact, even without close examination in PhotoShop, the photo has suspicious elements. Why is the man at right looking away from the motorcyclists? Why is he wearing such an enormous overcoat? And why is he holding it out in front of him? That "coat" is hiding something. He's not holding it that far out. He couldn't be, unless his arms are twice human length. And the coat wasn't originally so big. It was made the size of a tent by an artist who even expanded the collar of the coat in a vain effort to make it seem real. It's logical to conclude that whatever the "coat" is hiding has something to do with that van behind it. It's a tidy little vehicle, not big enough to hold anything or anyone very important. Why go to the trouble to disguise any markings or registration numbers on it? Note that the vehicle behind it is clearly showing a partial registration number. Well, we suspect from my blog item that this same group of Royal Navy Wrens spent a day riding around the Admiralty building in London as still pictures were shot. But I also believe that motion pictures of them were made, and that they are the same women who appear in this short film clip from the 1943 documentary The Battle of Britain. That's the key. Motion picture equipment is bulky and likely got to the location in a van like the trim little vehicle we see in the photo. Something written on the back of that van gave away the photographer's presence. It turned a supposedly unposed photograph into an obvious set-up. Propaganda isn't nearly as effective if we don't believe it's the truth. Perhaps the man staring out of the photo in the greatcoat was positioned to block the van, but didn't succeed in blocking enough of it. Luckily, a skilled artist was on hand to do the job with a paint brush. It was unforeseen that we would ever see through the make-up job. One last thing: what makes me think the retouching was done by the official department (Royal Navy?) that originally distributed the photo, rather than later by some random newspaper or magazine? Simple. In my experience, newspaper artists were so loaded with work, and most newspaper printing was so poor (and thus forgiving), that retouching at that level was much less careful. It's the attention given to the collar of the coat that convinces me this was a careful counterfeiting job. Collar is too big, and you can see through it! Neat. I think you might have collared that one David!